Well folks, hate to break it to you, but it’s October. And a rainy, cold October 1, at that. Here’s something to warm you up. 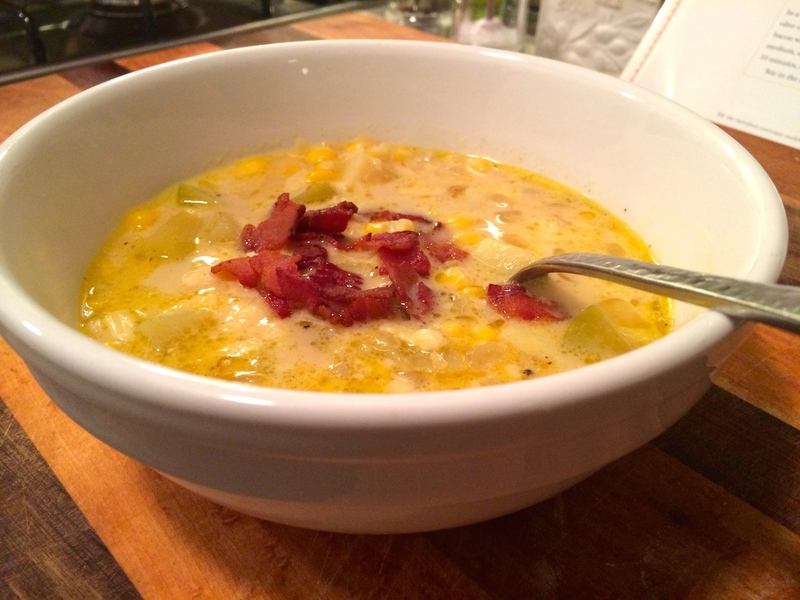 I am a soup lover — it’s so easy to make, and the leftovers are fantastic. They even get better with a little time! 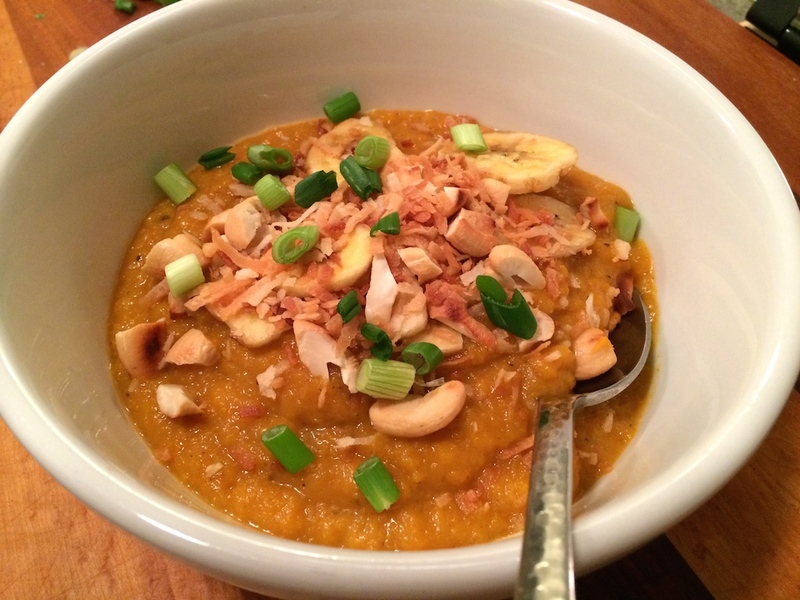 This squash soup has a great Indian twist with curry, plus my favorite part, which was the crunchy coconut and cashews on top. Whip up a big batch and curl up on the couch with a hot bowl and glass of wine. You’re welcome! Instead of the food mill/food processor route, I use my handy immersion blender to puree the soup. 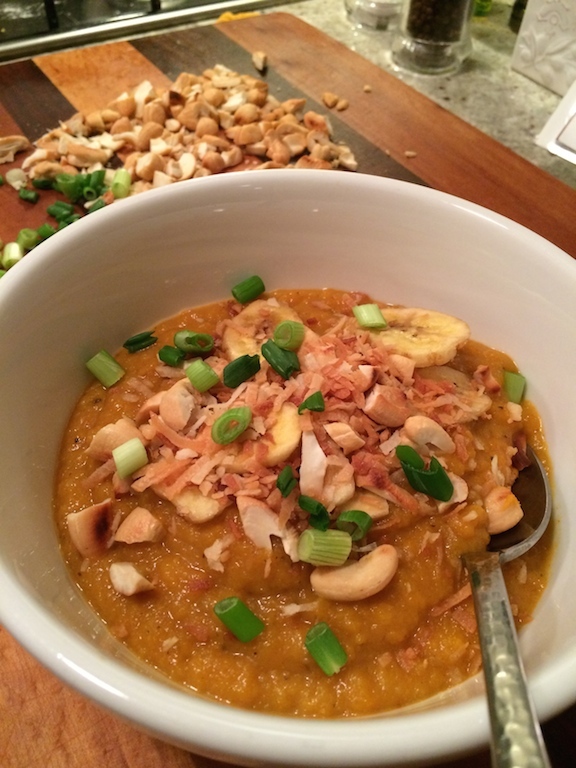 Easy, and you don’t have to transfer the soup from container to container. Store the leftovers in quart ziplocs with 1-2 servings in each, freeze and reheat for an easy meal out of the freezer. Cut the butternut squash, onions, and apples into 1-inch cubes. Place them on a sheet pan and toss them with the olive oil, 1 teaspoon salt, and 1/2 teaspoon pepper. Divide the squash mixture between 2 sheet pans and spread in a single layer. Roast for 35 to 45 minutes, tossing occasionally, until very tender. Meanwhile, heat the chicken stock to a simmer. When the vegetables are done, put them through a food mill fitted with the medium blade. (Alternatively, you can place the roasted vegetables in batches in a food processor fitted with the steel blade. Add some of the chicken stock and coarsely puree.) When all of the vegetables are processed, place them in a large pot and add enough chicken stock to make a thick soup. Add the curry powder, 1 teaspoon salt, and 1/2 teaspoon pepper. Taste for seasonings to be sure there’s enough salt and pepper to bring out the curry flavor. Reheat and serve hot with condiments either on the side or on top of each serving. It’s been chilly and I’ve been sick, so when I finally had enough energy to leave the house yesterday, soup ingredients were in order. It’s just a short walk from my apartment to Chelsea Market–couldn’t have planned that better!–so I bundled up and set out with my purse full of tissues. There’s a great but small market called Manhattan Fruit Exchange in Chelsea Market that carries some of the best produce I’ve seen–and every kind imaginable, from 10 kinds of kale to real, legit baby corn in a husk (who knew that was an actual vegetable? )–and at great prices since they wholesale it to the Food Network (located in the same building) and tons of other restaurants in Manhattan. They also carry a great cheese selection, tons of nuts and dried fruit and good pantry staples, but don’t come here looking for much in the freezer or refrigerated case–it’s very limited. Definitely worth a trip if you’re looking for great produce. And since I was there, I just HAD to stop for a meat pie at Tuck Shop. This was by far my favorite bite on a recent Chelsea Market foodie tour I took with my girls Shahnaz and Anna. It’s delicious crust around perfectly seasoned beef — what could be better? Add some sriracha and you’ll be in heaven. We went to 10 different spots on the tour, so that’s saying something! 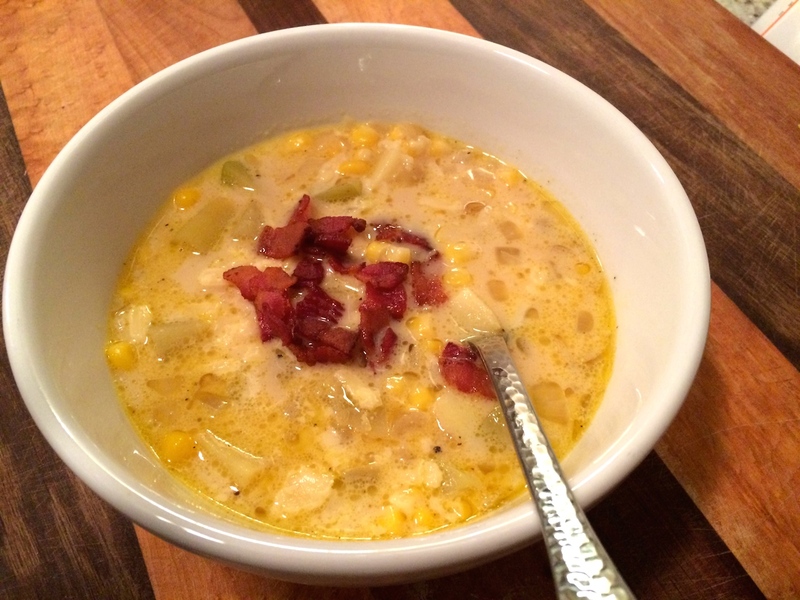 Back to the cheddar corn chowder — I chose frozen corn this time around since the fresh didn’t look great, but I can imagine that this soup with fresh, sweet corn would be even more amazing. It’s definitely getting a revisit from me to try that out. But it was a delicious success anyway — you get lots of great bacon flavor by sautéing the onions in bacon fat, and great corn flavor with some heft from the potatoes. A great meal on its own, or add some cornbread or a baguette and green salad (or meat pie) and you’re golden. 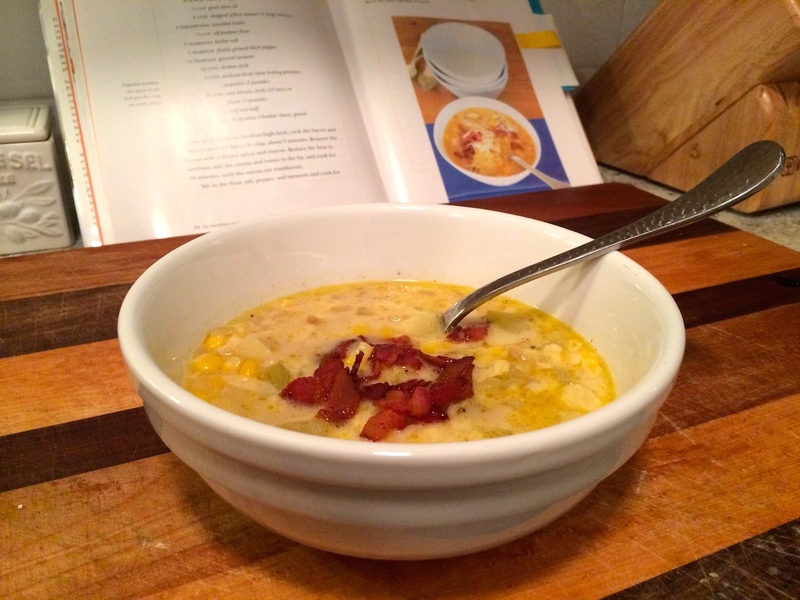 This is an Ina Garten recipe–love her stuff. Cut the recipe in half. Seriously, unless you’re cooking for 12 or want to freeze some. It makes a LOT. Use homemade stock if you have it. If you don’t, learn to make it! I used thin-skinned Yukon potatoes — as long as the skin isn’t thick like a russet potato, you’re good. 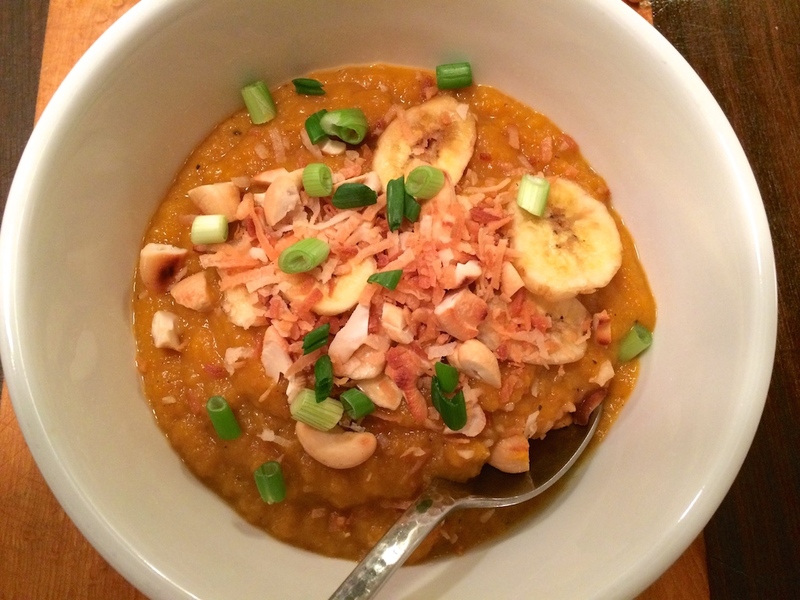 You could even use red-skinned potatoes to give it a little more color.